Hi Kezia! Let's start simple: what’s your favourite way to workout? My absolute favourite activity is rowing; I love the water and being part of a team. So what does an average workout week look like for you? I train five days a week, with rest days on Tuesdays and Saturdays. I usually start the week with a 7-10km run. On Wednesdays I hit the river and row for a couple of hours, Thursdays I do circuits, and on Friday I do three 10-minute sets on the ergo machine. And I finish off the week with an early morning row on the Thames. 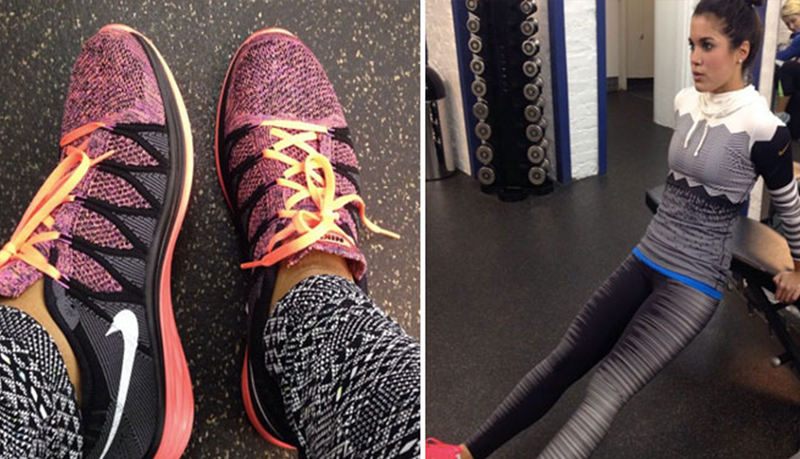 How do you stay stylish when you’re working out? I like to wear patterned and colourful kit. Nike’s Legendary Tights are a favourite; at the moment I’m wearing their Waves Training Pants. They feature the softest fabric of any Nike training pants, plus they’re designed with feminine lines and a fit that hugs your legs from hip to hem for maximum comfort and a flattering look during your workout. Which five songs are currently boosting your workout playlist? Did you make any health and fitness resolutions for 2015? Yes; to compete in the Henley Regatta. What's your favourite healthy feast? Tuna steak with baked potatoes and mediterranean vegetables. And when you’re treating yourself, what do you reach for? I do love a piece of Galaxy chocolate. What do you find is the biggest mistake people make when it comes to exercising? Not varying their exercise regime and sticking to what they know. I think it’s so important to vary your training; it prevents the boredom people experience when they do the same thing workout after workout, and will help to avoid reaching a plateau in workout performance, and subsequently in results! Finally, what makes you happy? The feeling I get after a two-hour row on the Thames always puts a smile on my face.